Current owner bought Cadillac from an Ohio Highline car dealership in 2015. 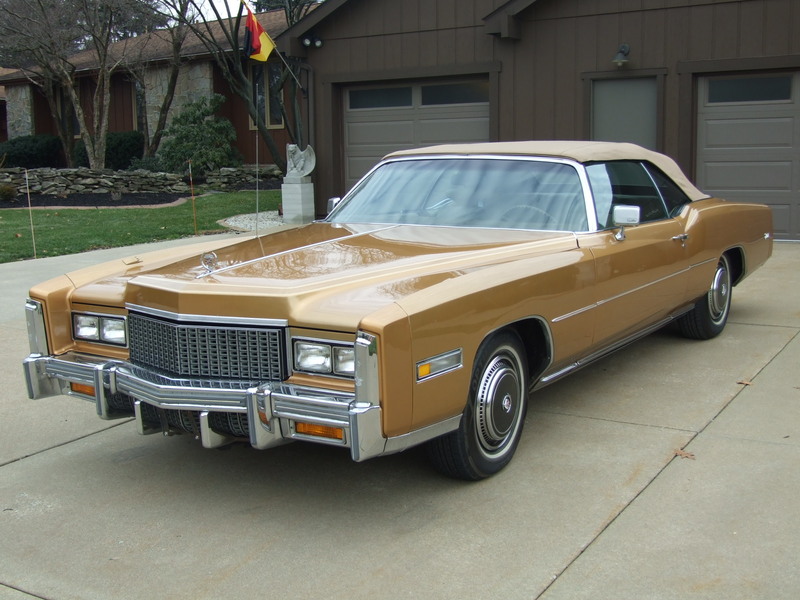 This is a great example of an Eldorado that has been left pretty much original, with owner spending the money to maintain and keep it as designed, and built without taking short cuts. It has received a typical re-coating of the paint. Ten plus years ago the owner had a car like this that was not in nearly this good of condition which we sold for him. 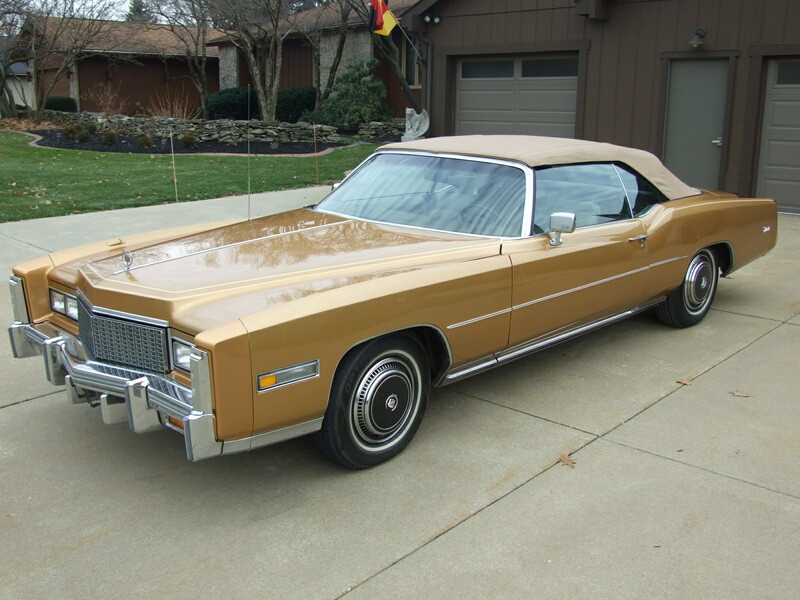 He decided a couple years ago he wanted to find one in nice mostly original condition, so around a year ago he started us on a mission to try and find a really nice, appropriate Cadillac Eldorado. We found one, and while he really loves it he found he just doesn’t have the time to enjoy it like he thought he would. Buyer are required- To do their own research to verify the researched codes below are correct. * The paint is extremely smooth, shiny, well polished out, and matches well all the way around. * You will not see any orange peel, as the finishing of the final detailing, of paint has been very professionally done. * The stripe appears to be painted on. If it is a taped stripe it may have been cleared over because it really appears extremely neat. The stripe has nice crisp lines however it was done. * Sometime during it’s life the car did receive a very nice high quality repaint. This is very common as so many of the older lacquer paint jobs would often wear off from polishing, or dry out and develop cracking in later years. * It would be our guess that the plastic fillers which often crack may have been replaced at some time, because we do not see any obvious indications of them being damaged or cracked. We do not see any wordage above the rear taillights indicating that they are a factory piece, being replaced is certainly a very positive thing on these cars. * We have no knowledge of the age, or the type of paint. * There is slight scratch where the drivers door, and hood come together. Which is very common as it is a very difficult area to keep alined. * At a particular angle in certain lighting, you will notice the plastic fillers that run between the fenders, and the bumpers are a non- metallic item. They always seem to take the paint differently and are a shade off. * Because the door jams where still in great condition, they where not touched during the repaint. You will notice a slight difference. * On the rear quarters as they wrap up toward the roof you can see (in bright florescent light) a circular area where the finish may have taken a little differently. * The car does have the optional hard boot vs. vinyl for over the lowered convertible top. * The body of the car is in beautiful condition, in terms of it being very straight and pretty much just as you would have expected it to look when it was almost new. It certainly shows that in the process of getting it ready to paint, someone had professionally prepared it to receive the paint. If there where any repairs to be preformed they where expertly done. * We do not see any dents in the car. * All of the gaps seems to be fairly appropriate without any extremely off tolerances anywhere. * In taking several random readings of the paint depth on each panel of the car with a paint gauge, it appears to be much of the thickness that you would expect a good quality repaint to be applied. The top surfaces of the hood and the trunk are mostly in the readings of 10-14 mils of paint, and the sides are typically more in the 8-12 mils range. It is very typical for the top paint to be a little thicker. * The paint seems consistent all the way around. We will indicate that the left rear quarter measured out that it might have had a couple minor dent repairs at sometime in its life. * Look inside the doors as well as the pictures of the underside. It looks like the cars was undercoated, and rust proofed when it was new or sometime earlier in its life, and probably why it has held up so well over the years. * All of the proper exterior bright work on the car appears to be in place as it should, and looks secured properly. * The stainless and chrome around the window areas is all in good condition. * When the cars where built new there was a little plastic shiny piece that wrapped around the rear fillers. Those pieces often don’t survive very long, and they are not on the car. * The drivers door handle and door button is just a touch lose and needs tightened, it is barely noticeable but does exist. * All the glass is very clear without discoloring, delamination, wiper marks, cracks, bull-eyes, or deep scratches. * The windows on the sides could very well be original glass. They are LOF safely Flo-lite(all four trademarks look to be the same). * The front glass is also Lof, and without bull-eyes or wear. It would be our guess this windshield was replaced not to many years ago. * The rear window is “star” glass. We are not familiar with what they used when manufactured it may have been changed with the top. 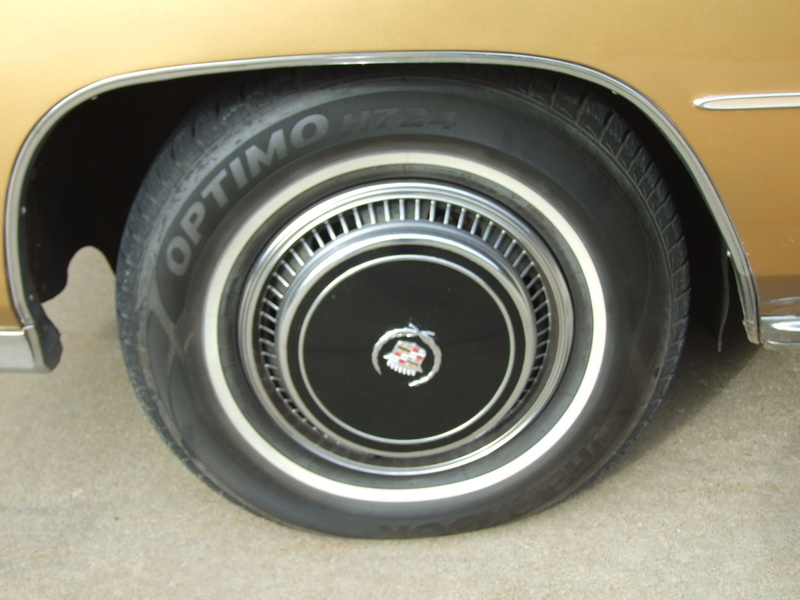 * While we do not know its age at some point an owner had done away with a lesser quality thin vinyl top that where used in the day, and opted for more the type of cloth they typically use on high line European cars. * The coloring all appears very even without any obvious fading spots, and the stitching all appears to be intact all the way around. * The top is nice and soft as it would typically be. * The top is a power roof with a glass rear window, and a rear defroster unit in the glass. * Though this interior is not perfect I was very impressed with the condition of what appears to be an all pretty much original interior. So many of these cars the interior was not taken care of, and would crack and sustain damage. The carpets, seating, and door panels are typically replaced, and very seldom does it look correct or original. Without them being original equipment exact fits, and a lot of times the seats are only redone in vinyl, not real leather. * The leather seats are still pretty soft, and you’ll notice the upholstered areas are not damaged. You will notice the typical sun damage, and the lighting of colors on the seats and steering wheel covers. 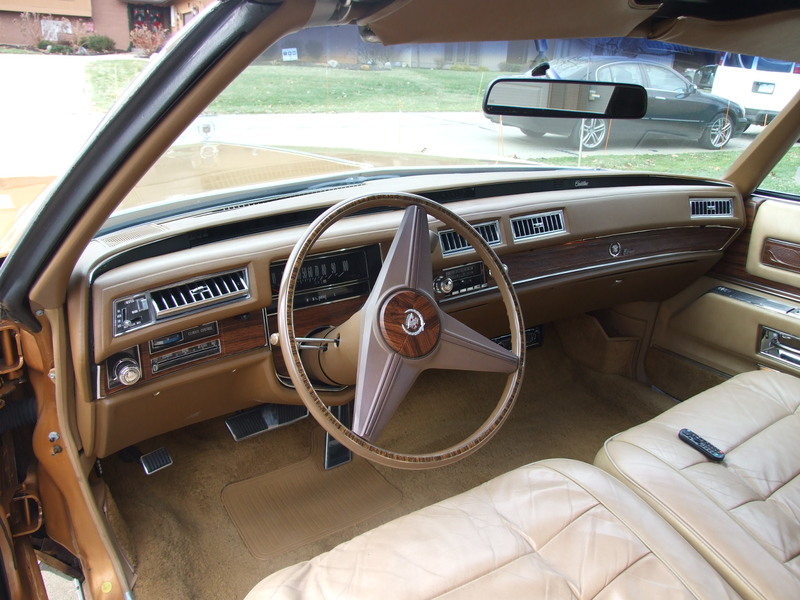 * I think with some re-padding of the drivers seat, and some light coloring and attention to detail and cleaning you could have a desired type seating that a lot of Eldorado owners wish they still had. * The visors have good color, and are solid and not broken down. The illuminated mirror does work on the passenger side, but the little door will not stay shut when down. * On the dash all the controls show very minimal wear, and it looks very nice. Possibly had a little repair made just in front of the clock on top of the vinyl there is a little bit of wave to it. * Steering wheel does not show any cracking, and the wooden applique on top shows little wear. * Owner had a Kenwood remote system installed. * The door panels are in really nice condition, both the wood, chrome, and the vinyl. Even the drivers side where you rest your elbow has hardly any wear at all. * The pictures show the mats, and the carpet which appears to be original and all is in nice condition for the age. I will note in the right rear there is slight separation in the carpet right where it would reach the mat. There are still not many 40 year old cars that have an interior in this condition. * The trunk appears to have no modifications, and is pretty much the way they came. * The felt covering at the bottom and the sides has a little bit of wear, but this can be easily purchased if somebody wanted to. 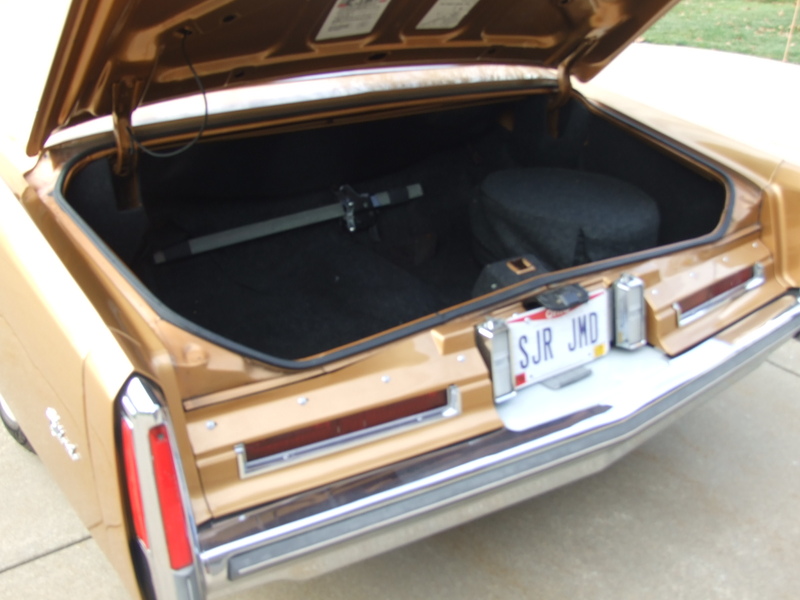 *Trunk has the typical space saver for the tire. The canister is missing and probably ran out of air and so that is not included. * You will also see the hard boot as well as the cover, and a couple of 8 track tapes that come with the car. 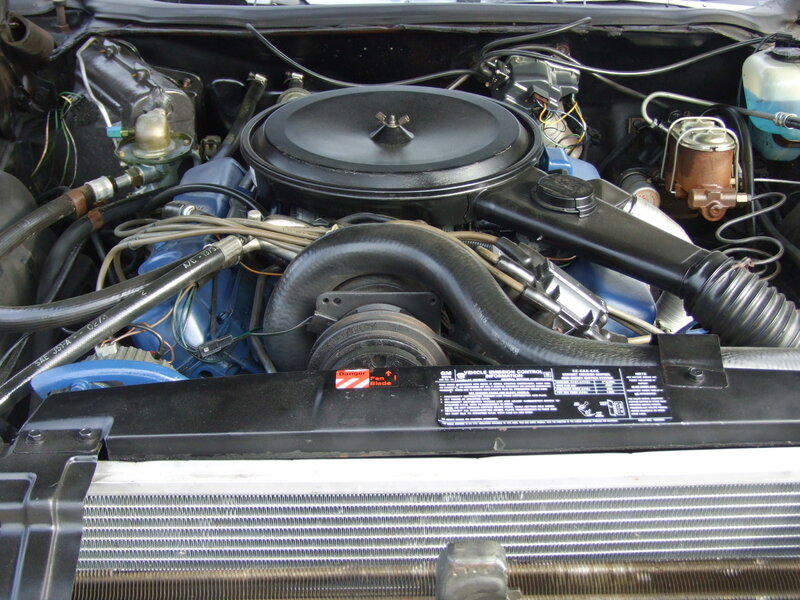 * The under hood area I would say that it does have the correct style blue paint on the engine. It all looks like it has been kept in the original form, with the exception of the replacement battery, and the rust proofing you can see on top of the fender wells. * When we had it on a rack, and inspected the bottom side I had talked about fluid that was below the hydraulic cylinder. The owner had that looked at a years ago, and it was said to be fixed. When I took a photo and inspected it from the top side it doesn’t appear to be leaking down into that area anymore. * Engine has had a replacement radiator or the radiator has been redone, and is not painted black as it originally would be. 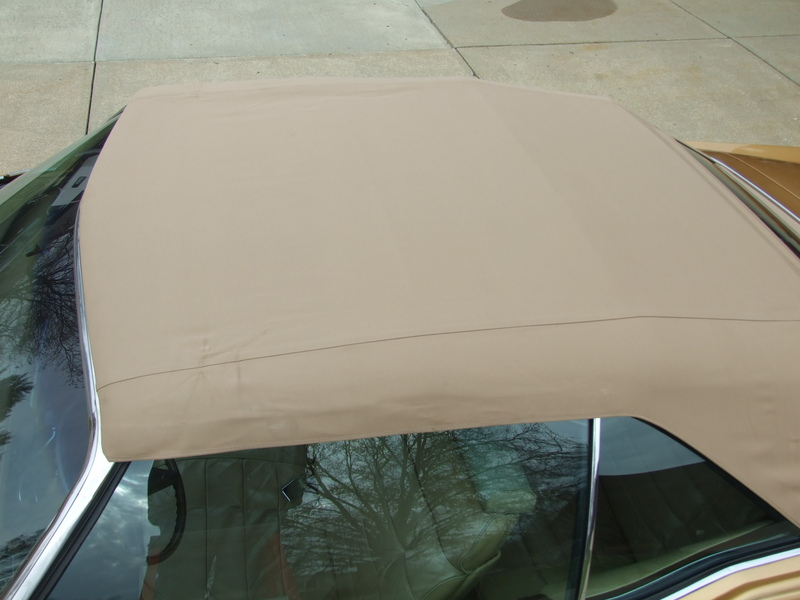 * The insulation under the hood is in good condition and does not show tares or damage. * Starts cold as designed and runs properly- warm/small hesitation on quick acceleration. * The chassis has not recently had any rustproofing applied to the bottom side, which is nice because it shows what the underside looks like without anything being covered up. 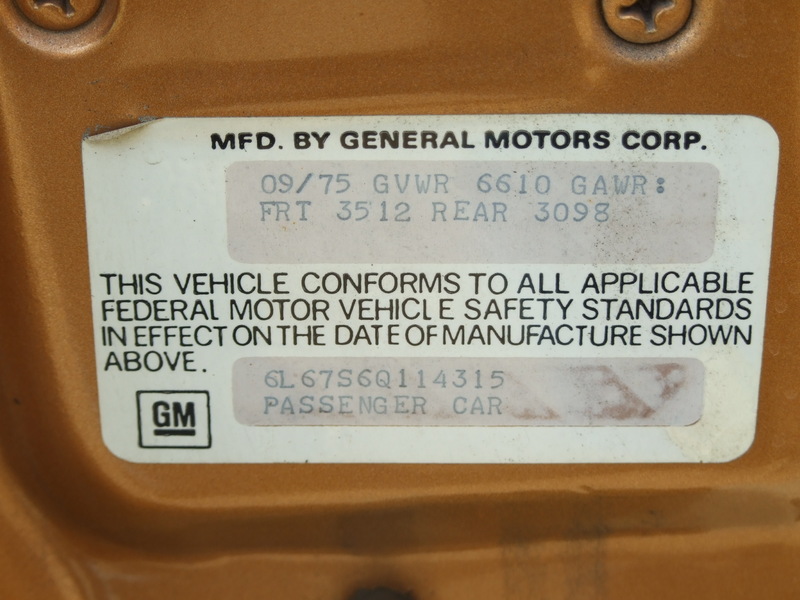 * Sticker on door shows car has been rustproofed at one time, possibly when car was new, or possibly later. It has held up well and did its job, but typically as they do the exposed area dries out a bit and flakes off. That is why you will see a bit of surface rust. * I did not see any rust perforation on the frame, suspension components, floors or trunk, it is a nice natural rust perforation free car. * Car has a fairly new battery, fuel pump is recent, and replacement starter. Steering box is dry. There is just a little dampness at the front of the engine. New stabilizer links at the front, and has fairly recent boots. * Down along frames rails you will see slight surface rust, but all look good and solid. * Recent rubber lines here and there have been replaced. 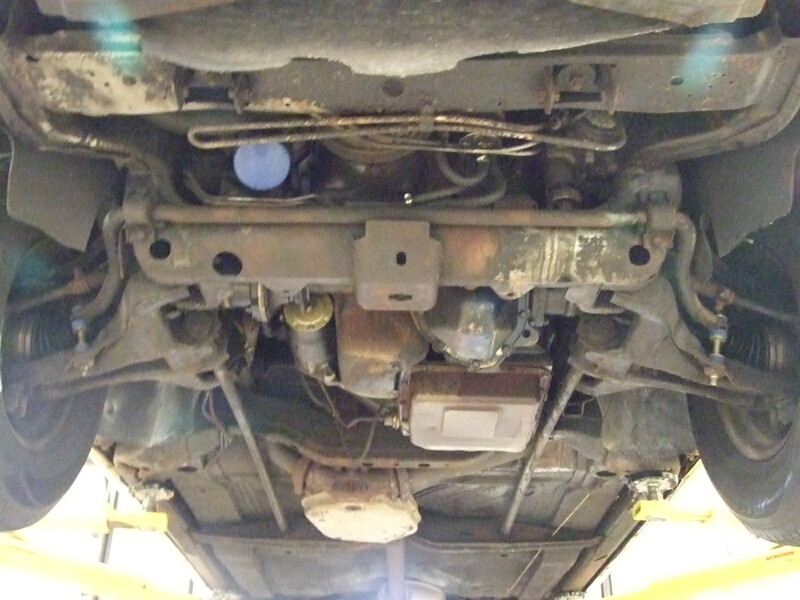 * Muffler does appear to be intact, but appears to have a pin size hole in the rear resonator. * Back shocks look recent as well as the lines running to them, and all looks to be intact. * Brake calibers front and rear, as well as pads look very recent. * Back of the bumpers, mounts, and extentions show little surface rust, but looks good and solid. I drove the car for probably ten miles with speeds up to 50 mph, and it really seems as though everything was working correctly and the way it was designed to. The steering had very good and proper assist, and worked very smoothly. The car accelerated very smoothly, and up shifted as I remember them being designed to, and automatically down shifted when we came to a stop. It seems to stop properly upon braking, it stopped with good power assist and smoothly. I did not notice any pulsation or shuddering of the brakes. During braking the car did not pull to the left or right. The engine appears to be proper set up for starting cold, and idling down afterword, it was actually just adjusted at service facility.